Content Grabber provides an Agent scheduling facility that enables you to automatically run your agent at predetermined time slots whenever you need it to run. This can be done every hour, every day, month, year and so on. Once you have completed your agent, you will be able to access this facility. From the Agent Settings menu at the top of the Content Grabber application. 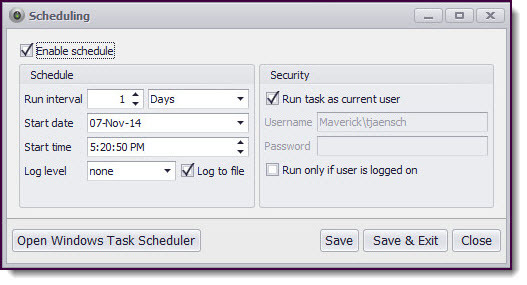 Simply Click on the Schedule menu option to display the Scheduling window. For details on how to configure Content Grabber's Scheduling feature, or if you'd like to learn how to use Windows Task Scheduler with your Agents, refer to Scheduling in the Content Grabber Editor section. In the next section, Run Your Agent we will show you how you run your finished web-scraping Agent.